Jan Fergus (email: jsf1@lehigh.edu), Professor Emerita of English at Lehigh University, has spoken at many JASNA meetings and published two books and many articles on Austen as well as, most recently, Provincial Readers in Eighteenth-Century England (OUP). I wrote the introduction to My Dear Charlotte. Its author, Hazel Holt, is a dear friend of mine, who has now published twenty Sheila Malory detective novels. When she first got the idea to write this novel in letters, also a mystery novel, I encouraged her, desperate to have the treat of a work based on the style of Austen’s letters. One of my major problems with all the Austen imitations and sequels is style—no one can imitate the style of the novels. But the style of the letters is more approachable, so for me right away this novel is the only successful Austen imitation. Holt not only imitates the style of the letters—she incorporates actual phrases, even whole sentences from them. Think of the risk! Imagine having your own prose sitting beside Austen’s and hoping that no one can tell the difference. At first she is cagey—in the very first letter of her novel, less than two pages long, she quotes from eleven different pages in the Austen letters—but never exactly word for word. In this way, Holt immediately diffuses a sense of Austen’s language, attitudes, and world. Soon afterward, having established that world, she begins to incorporate larger chunks of Austen verbatim from the out-of-copyright Brabourne edition of the letters (to avoid copyright issues). First, all the letters are by a younger sister to an older, Elinor Cowper to her dear Charlotte, just as we have primarily Jane’s letters to her beloved older sister Cassandra. We have also the wonderful letter in Persuasion from the younger Mary Musgrove to the older Anne Elliot in Bath—the one in which we find the perfect line “‘my sore-throats, you know, are always worse than anybody’s’” (164), and we will see that Mary Musgrove looms large in this novel. Elinor begins her first letter with the title phrase, “My Dear Charlotte,” which is of course an allusion to “My dear Cassandra,” the way in which Austen begins most of her letters to her sister. In fact, the first paragraph of this first letter says a great deal about sisterly relations between the characters, inevitably with some attention to the relations between Jane and Cassandra. And later on some connections to the novels’ sisters reveal themselves as well. Your letter this morning was quite unexpected and disappointed me of my first sentence which I had planned, full of proper hopes about your journey. I was sorry to hear that your trunk was too heavy to go by the coach from Taunton, but you were fortunate to find a wagon that could convey it all the way to Bath. I do indeed hope that you may not have taken cold after your stop at Shepton Mallet, but I have often found the brief introduction of a warming pan into cold sheets does provoke the feeling of dampness without the actual ill effects. As the illustration shows, the first sentence here, like the salutation, is borrowed from a specific Austen letter, dated 1 Oct. 1808, but not quite word for word: “Your letter this morning was quite unexpected, & it is well that it brings such good news to counterbalance the disappointment to me of losing my first sentence, which I had arranged full of proper hopes about your Journey.” We have here a sisterly joke on the conventions of correspondence. Though Elinor’s letter alters the noun “disappointment” into a verb, “disappointed,” both openings insist on the joke that letters follow certain rules. One must produce “proper hopes” about a trip, and getting the news of the trip early means those conventional hopes have to be jettisoned. Already we see that Elinor and Charlotte, like Jane and Cassandra, enjoy closeness and share some humor at least about what goes on when conventional banalities are exchanged. Notice, however, that Holt has taken out Austen’s phrase about “good news.” That phrase would make us expect Elinor to plunge into a response to such news, as Austen’s letter immediately does—in that case the good news that their brother Edward’s last child was safely born. Instead, Elinor replies to the evil news that the trunk caused problems but then the evidently good news that Charlotte could send it to Bath after all—alluding to an Austen letter written nine years earlier about Austen’s own journey to Bath: Austen’s trunk “was too heavy to go by the Coach . . . & for a long time we could hear of no Waggon to convey it” (17 May 1799). We learn here, in short, that Charlotte has told one of the stories, so familiar to travelers, about trouble with baggage—with a hint that she is perhaps something of a whiner. After all, Austen’s account of the trunk begins with a wonderful line from the letters, “I have some hopes of being plagued about my Trunk.” With this line Austen signals her knowledge that we love our whines—we perversely hope for trunk trouble so that we can whine. One senses that Charlotte is perhaps not quite aware of how much she likes to complain, and that her sister Elinor knows it. 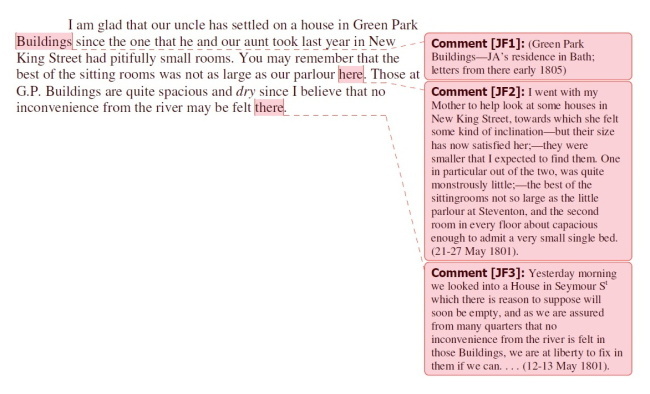 We find confirmation for this perception in the next complicated sentence: “I do indeed hope that you may not have taken cold after your stop at Shepton Mallet, but I have often found the brief introduction of a warming pan into cold sheets does provoke the feeling of dampness without the actual ill effects.” This sentence, unlike the first two, has no parallel in Austen’s letters, though it can suggest Persuasion. But what does it tell us about Charlotte and her letter? First, Charlotte feels she is coming down with a cold thanks to the stop at Shepton Mallet. Evidently they stayed there overnight, and a warming pan was used on the possibly damp sheets in Charlotte’s strange bed—perhaps at Charlotte’s insistence. Elinor is trying to reassure her sister, saying that perhaps she felt damp at Shepton Mallet because of the warming pan, which can, according to Elinor, produce the feeling of damp but none of the ill effects—that is, damp is thought to produce colds, but perhaps there was no real damp, only illusory damp, so Elinor hopes that perhaps there will be no cold after all. The more you read in My Dear Charlotte, the more you realize that Elinor’s dear Charlotte is a bit of a hypochondriac, like Mary Musgrove, always ill, more ill (she feels) than other people realize, and always letting you know it. Remember Mary’s first lines in Persuasion: “‘So, you are come at last! I began to think I should never see you. I am so ill I can hardly speak. I have not seen a creature the whole morning!’” (37). And Elinor, like Anne Elliot, is very tolerant and sympathetic in response to her sister’s imaginary complaints, though she is also, like Anne, always trying to cheer her sister up and reassure her that her state is perhaps better than she thinks. Elinor doesn’t try to joke Charlotte out of her sense that she is ill any more than Anne does her sister Mary—for Charlotte as for Mary, it’s evidently much too serious a subject. Anne “cheerfully” tells Mary that “‘you will soon be better now. . . . You know I always cure you when I come’” (38). Anne treats Mary’s imaginary illness seriously. Similarly, Elinor suggests not that Charlotte’s cold is imaginary, but that her apprehensions of a cold are possibly caused by the false feeling of damp sheets, not actually damp sheets. She is consoling and sympathetic, not impatient. I wrote in the introduction to My Dear Charlotte that once I had realized what a hypochondriac Charlotte was, I wanted to reread Austen’s letters for hints that Cassandra was also, and there are a few. For instance, on 9 April 1805 Austen writes “I am heartily glad that you can speak so comfortably of your own health & looks . . .”; and in August of that year, “You continue, I suppose, taking hartshorn, and I hope with good effect” (30 August 1805). Hartshorn was used in a number of ways for a number of ailments; a common one was diarrhea. Three years later, once their sister-in-law Elizabeth has given birth to the last of her children, Austen writes to Cassandra, “—We are also very glad to know that you are so well yourself, & pray you to continue so” (7 October 1808), as if Cassandra’s health is a continuing issue, and sure enough a few days later, once Elizabeth has suddenly died, the concern mounts: Austen writes, “May the Almighty sustain you all—& keep you my dearest Cassandra well—but for the present I dare say you are equal to everything” (13 October 1808), then in a week or so, “If you escape a bilious attack, I shall wonder almost as much as rejoice” (25 October 1808). In the same letter, Austen quotes a friend who has written of Cassandra, “‘I most sincerely hope her health will not suffer’” (152) by her exertions for the family after Elizabeth’s death—so that Cassandra’s health constituted a worry even outside the family.1 There are at least four more instances in which Austen mentions Cassandra’s health, three of which are negative—the strongest being worry over how the cold will affect her at a visit to Manydown in 1813: “Poor wretch! I can see you shivering away, with your miserable feeling feet” (29 January 1813). The letters are full of references to illnesses of all kinds and of varying severity. Of course in a small community where nothing much happens the two staple subjects for conversation (or letter writing) are (still) the weather and people’s ill health. And the latter is usually more dramatic, so mentioned more often. Because there were so many tempting bits in the letters I couldn’t resist using them and it seemed natural to make Charlotte someone who is “careful” of her health. And, of course, in Bath there is an embarras de richesse of that sort of material about all the “invalids” there. But, just in the general course of everyday life, even small things like Mrs Austen’s cold (cured with Steele’s lavender water if I remember rightly) or Martha’s earache are considered worth reporting. I was amused to see that Mrs Austen’s “oppression in her head” mentioned by Mrs Crowe (“the sensation of a peck loaf resting on my head”) cured with calomel, was very similar to Queen Victoria writing about feeling as if an elephant was standing on her head—which she blamed on barometric pressure (so presumably no cure)! However it happened, Holt created the hypochondriacal sister Charlotte for her heroine’s sister, and it turns out that she wasn’t in so doing completely misrepresenting Austen’s sister Cassandra. In any case, Austen, like Elinor Cowper and Anne Elliot, is very indulgent to a sister’s health complaints, and though Cassandra is much more stoical than Charlotte Cowper or Mary Musgrove, she does appear to have made her health a family concern. In the rest of My Dear Charlotte, readers will find themelves amused at how often Elinor Cowper seems to be responding to a health whine from Charlotte Cowper—far more often than Jane Austen does for Cassandra. Readers will also see how love between the Cowper sisters, and for that matter the Austen sisters, expresses itself not just as shared humor, though that is essential, but as knowledge. And while what is said here will relate to Holt’s characters, readers may easily make comparisons to what we know of the Austens. But first, some qualifications. Elinor and Charlotte come from a family more solidly located in the gentry than the Austens. Not only do the Cowpers have a better income, but Mr. Cowper actually has landed property amounting to £2000 a year (like Mr. Bennet), and one of the sons is in the diplomatic service, something only possible through considerable “interest,” the influence of people in power. Despite this higher class position, Elinor is a desperate walker, as Jane Austen herself was—the Cowper property is close enough to the nearest town, Lyme, that Elinor walks there frequently to shop or to pay calls, just as the Bennet sisters walk to Meryton. Satirical indeed—with lovely sentence structure and no phrases from Austen’s letters. Charlotte, clearly more deliberate than her sister, thinks Elinor too impulsive—“something you have often had cause to reprove me for” (57). But whatever strictures Charlotte offers to her sister, Elinor takes them gracefully, without irritation, perhaps because she is so good at going her own way nonetheless. She refers to Charlotte’s critique of her as sometimes hoydenish: Elinor cites the “many lectures” Charlotte has given her “about my unladylike behaviour, when I walked back through the town with my petticoats muddy and bedraggled from searching for fossils when the tide had just gone out, which Frank always said was a splendid time to find them” (69). Here of course, though we cannot imagine Jane Bennet giving many lectures to Elizabeth, we will still be reminded of Elizabeth Bennet’s muddy petticoat after her walk to Netherfield in Pride and Prejudice. But equally often Persuasion will spring to mind because the Cowpers live near Lyme. Right next to Lyme is Charmouth, still a good place to hunt fossils, and which Austen’s narrator briefly but glowingly describes in Persuasion: “with its high grounds and extensive sweeps of country, and still more its sweet retired bay, backed by dark cliffs, where fragments of low rock among the sands make it the happiest spot for watching the flow of the tide, for sitting in unwearied contemplation” (95). The sisters live in beautiful country, and Elinor at least takes full advantage of it even if her sister finds doing so a bit improper. Elinor and Charlotte are extremely interested in the social world around them, and exchange information about relatives and neighbors—so that for Elinor to have a genuine mystery to write of is a great delight to both. In fact, Charlotte gets drawn in. Elinor writes that she “was much struck by your observation that it is no wonder [the magistrate] is still investigating Mrs Woodstock’s death since there are so many who might profit by it” (59). Here and elsewhere she prods Elinor for information about the magistrate and has evidently communicated her own “misgivings” to Elinor about the questionable death, while their mother Mrs. Cowper dismisses all such speculation by referring the matter to her own Dr. King, whom she relies on as an oracle much as Mr. Woodhouse relies on Perry: “When I mentioned your misgivings to our mother, she declared that if it had been so Dr King would certainly have mentioned it. So that must be the final judgement on the matter” (50). The sisters unite in affectionate pleasure at their mother’s foibles, including her certainty, and unite too in helping her in the home although Mrs. Cowper, unlike Jane and Cassandra’s mother, is not ailing. We become aware of Charlotte’s central place in the family in part because of how much Elinor misses her help in housekeeping and making decisions. And here is one of many places where Holt can allow her Elinor to express herself precisely in Jane Austen’s own words: “I endeavour as far as I can to supply your place, & be useful & keep things in order” (14 September 1808; see MDC 93). Elinor frankly finds housekeeping a drag, as Jane Austen seemed to also, and wishes her sister there to relieve her. The sisters are united also in trying to keep the complaints of their other sister Mary—significantly named!—to a minimum. The mystery is helpful here, as Elinor writes: “It is, as you say, fortunate that Mary is so interested in the story as to have forgotten her own troubles for the moment and I will do my best to keep you provided with any tid-bit of information that may excite her curiosity and thereby promote her better temper to the benefit of you all” (62-63). Minus the mystery, these qualities of shared loving interest in the world outside and in the foibles of those close to them are shared by Jane and Cassandra. But it is on the topic of young men that the Cowper sisters are most amusing—Elinor in her contradictory judgments of and responses to some of them, and Charlotte in her speculations, sometimes right and sometimes wrong, on what men Elinor really likes. Each is eager for the other to become romantically involved, and by the end of the novel both have become so despite some misjudgments that will remind us of those that Austen’s heroines demonstrate. In paragraph two, there is an interesting difference between Elinor’s “So I shall think of you happily established with a fire in your room and every kind of comfort about you” and the original, written from a room in Austen’s formidable aunt’s house in the Paragon at Bath: “I have the pleasure of writing from my own room up two pair of stairs, with everything very comfortable about me” (5 May 1801). Again, Elinor is trying to cheer up her sister, mentioning fires and comforts, to get her not to think herself ill—to emphasize that she is happily established. In the original, Austen is of course writing in her own person. Her focus is on her own room in her aunt’s house, how blessedly far it is away from everyone (two flights of stairs). We see here very different comforts—primarily physical for the complaining Charlotte, enjoining her to be happy with every comfort about her, and primarily social, or anti-social, for Austen. In paragraph three, the borrowed sentence seems very straightforward about a shared interest in fashion, a frequent topic of the letters. But notice the slight change: “I shall continue with my old straw bonnet which I fancy is as smart as other people’s” instead of Austen’s “I find my straw bonnet looking very much like other peoples & quite as smart” (6 May 1801). Though the changes probably just attempt to avoid copying exactly, Elinor is more fanciful than Austen—“I fancy”—and emphasizes the disjunction between her old bonnet and other people’s “smart” fashions. Hers may not really be as smart as others’ headgear but she shall think it so. Austen focuses on discovery—“I find” not “I fancy”—and it is not an old bonnet; the emphasis in Austen’s sentence is on observing what the bonnet is like. She offers a judgment not a fancy; the bonnet looks like others’ bonnets and is as smart. Holt has used this sentence to characterize the imaginative Elinor (“I fancy”), whereas Austen’s sentence reveals Austen’s very beady eye on fashion, which is not really an eye on herself, not a proclamation of vanity. In paragraph four, the sentence is satirical about the “old tricks” of ill health in a neighbor—despite Charlotte’s tendency that way. Perhaps we have here another slight hint to Charlotte not to fancy herself ill? In any case, the sentence goes on to be more satirical about Mrs. Woodstock, who is “pronouncing herself to be dying once more” and is summoning her nephew to her—we think of Mrs. Churchill in Emma, of course. In context, Austen’s letter is equally satiric, but about a woman who does not have the power to summon others to her side—rather the reverse. Instead, Lady Williams “is sent for a couple of Months among her friends. Perhaps she may make them sick” (9 February 1813). Austen’s satiric treatment of a possible hypochondriac farmed out to friends is sharper than Elinor’s comment, which attacks abuse of power: we immediately know that Mrs. Woodstock is a domestic tyrant. Austen’s letter is more ambiguous, seeming to attack both Lady Williams and the friends when imagining them sick also; it’s hard to locate where the domestic tyranny resides. A line like this one reminds us that we can never know the context of Austen’s letters perfectly since we cannot share her and Cassandra’s knowledge of her world. So it’s a treat to encounter her words in My Dear Charlotte, used in contexts that we can play at understanding. Incidentally, the rest of the paragraph shows Elinor’s interest in young men, a major topic, and the enjoyment of assemblies typical of Austen heroines. And in paragraph five we have the closest copy of an Austen sentence. Austen is writing to her sister at Godmersham, comparing their home’s unfashionable hours to those of their rich brother. The joke targets the snobbery that can result from a perception of unfashionableness (“despise us”), but in Austen the joke forms part of an attempt to imagine her sister’s life compared to theirs: “My father reads Cowper to us in the evening, to which I listen when I can. How do you spend your Evenings?—I guess that Eliz:th works, that you read to her, & that Edward goes to sleep” (18 December 1798). Holt uses the same sentence to set up a slight joke on fashion between the sisters—perhaps offering a suggestion that Charlotte is more concerned with fashion than Elinor is. Then paragraph six shows both pairs of sisters’ interest in gardening and in fruit crops (important for preserving over the winter), but Holt adds “By the blossom” to show why someone in May or June could make such a prediction about later harvest. In our city lives, harvests tend to be forgotten. The close, “stir the fire and call on Miss Williams,” cites a character who is mentioned only this once in the novel—someone completely negligible, then, but that “must” suggests the social requirements of Austen’s world and of Elinor’s, the demands that others have a right to make on us. And if the hen line is Holt’s, it shows the sisters’ appreciation of making a joke of Charlotte’s absence: Elinor clearly does miss her sister, as all the careful domestic details testify, but turns it into the joke that hens might revenge themselves on a missing Charlotte by ceasing to lay eggs. When I decided that I’d like to write a mystery novel set in the Regency period the obvious thing to do was immerse myself in the letters of Jane Austen. As you always do once you start reading them, you just go on and on. And as I did so a wild thought struck me. While there’s no way I’d be presumptuous enough to attempt any sort of pastiche of the novels, I thought—holding my breath—that since they are such wonderfully informal, chatty letters, I might just manage to create a sort of facsimile of her world if I wrote my novel in the form of letters, inserting extracts of hers where they would fit in with the story—the perfect, authentic background. I didn’t plan anything, but simply plunged in and started to write. It was all such fun—whenever I needed to describe an event—a ball, a social evening, a visit to the theatre, whatever—it was all there. And such wonderful descriptions of clothes and food and all sorts of domestic detail—total riches! I’ve never enjoyed writing anything so much, it was total pleasure. I was so fortunate to have a Jane Austen expert to keep an eye (a very beady eye) on every page I wrote to check it for authenticity. Often a page would be returned with a stern comment that the word or phrase I’d used was not authentic (“Georgette Heyer not J.A.”) or that something was not in period. I’m so grateful for this rigorous examination because it means that there is less chance of my having let down the purity of the originals. Because Jane Austen, in her letters, wrote as she spoke, having a conversation with the recipient (and of course there was no one with whom she would be more relaxed than she was with Cassandra), there is no form or structure to them as such, the words flow as they do in real life. This makes it easier to catch the flavour, the mood and the voice and easier to make the attempt to reproduce it. 1. Three months later, there’s been some injury, perhaps, and Austen writes, “I do not require you to write again before Sunday, provided I may beleive you & your finger going on quite well.—Take care of your precious self, do not work too hard, remember that Aunt Cassandras are quite as scarce as Miss Beverleys” (24 January 1809). The other negative reference to Cassandra’s health afterward not quoted in the essay is: “This is exactly the weather we could wish for, if you are but well enough to enjoy it” (24 January 1813). 2. See “‘Rivalry, Treachery between sisters! Tensions between Brothers and Sisters in Austen’s Novels,” my plenary talk from JASNA’s 2009 AGM in Philadelphia. 3. Note that, whether or not the sentence about hens is Austen’s or Holt’s, Holt sometimes manages to improve on Austen’s sentences. Consider this remark from Austen’s letters: “Lady E. Hatton called here a few mornings ago, her Daughter Elizth with her, who says as little as ever, but holds up her head & smiles & is to be at the Races” (30 June 1808). Compare Holt’s: “I hope Miss Bennett is quite well again and had a comfortable dinner with you all. Does she remain as silent as ever? I recall, from my own last visit to Bath, the way she holds up her head and smiles and says nothing” (MDC 37). I think the addition of “and says nothing” is better as a conclusion to a sentence than “says as little as ever” in the middle. Holt’s choice of “Bennett” to replace Hatton is amusing—a private joke, I think, calling to mind a Mrs. Bennet who does nothing but talk. 4. The letter’s second paragraph weaves together a number of Austen’s references to looking for rental property in Bath. Austen, Jane. Jane Austen’s Letters. Ed. Deirdre Le Faye. 3rd ed. Oxford: OUP, 1995. _____. Persuasion. Ed. R. W. Chapman. 3rd ed. Oxford: OUP, 1965. Austen-Leigh, R.. A.., ed. Austen Papers. [Colchester]: Spottiswoode, 1942. Fergus, Jan. “‘Rivalry, Treachery between sisters!’: Tensions between Brothers and Sisters in Austen’s Novels.” Persuasions 31 (2009): forthcoming. Holt, Hazel. Email to Jan Fergus. 16 Aug. 2009; 28 Aug. 2009. _____. My Dear Charlotte (With the Assistance of Jane Austen’s Letters). Seattle: Coffeetown P, 2009.